Find Pain Relief Within Yourself! Regenerative medicine is a quickly advancing field in pain management that allows patients to use their own cell tissues to repair and rebuild damaged tissue. This effective form of pain relief is a long-term option that can treat a number of ailments. Find out if regenerative medicine can help you find relief from your pain! Select Health of the Twin Cities has created a strategic alliance with a board certified medical doctor who has specialized in regenerative medicine for many years. He was featured on “The Doctors” Tv show and has treated thousands of patients. Our Doctors will meet with you, and will discuss whether or not stem cells, PRP, or other therapies may benefit you as part of your treatment plan at Select Health of the Twin Cities. The Future of Back and Joint Pain Treatment is Here — Discover the Power of Regenerative Medicine. If you are like the millions of Americans who suffer from chronic back and joint pain, you are already well aware that finding an effective treatment is paramount to your well-being and overall quality of life. When you suffer from chronic pain that is related to joint, tendon, ligament, or spinal disk discomfort, everyday tasks can seem daunting and a reprieve from pain is fleeting. You may have tried everything — physical therapy, prescription pain medication, Chinese medicine, and even surgery. At Select Health of the Twin Cities, we understand that finding a real solution is your priority, that’s why it is our priority too. Among our other great treatment options, you may also benefit from the miracle of regenerative medicine. Regenerative medicine is the art and science of replacing tissue or organs that have been damaged. Regenerative medicine is the practice of facilitating healing and restoration through the use of the body’s own cells. There are a number of conditions and treatment options available. Regenerative medicine can be used to generate and repair damaged organs and tissues and even create new tissues. However, at Select Health of the Twin Cities, we use this technology to help treat chronic back and joint pain and will one day be used to treat neuropathy. Regenerative medicine affords the opportunity of safe, natural healing and reduces the need for surgical intervention. Because regenerative medicine works at the cellular level to actually repair damaged tissue, rather than mask or treat the symptoms, there is a better long-term success rate for effective pain management without the use of prescription pain medication. While there may be some downtime during the body’s natural healing process and tissue building, regenerative medicine has proven to have better results than joint replacement! Because the cells are harvested from your own body, there is no concern about rejection and very little concern about infection. For regenerative medicine in the Twin City area, schedule a consultation with Select Health of the Twin Cities today! Platelet-rich plasma (PRP) therapy uses your own concentrated platelets to promote healing. A small amount of blood will be collected and then spun down to isolate the platelets. Platelets are a critical component of the healing process. When the platelets are isolated and injected directly into an injury site, they help to quickly stimulate the healing process. If you suffer from any of these conditions or have sustained a back or joint injury, schedule a complimentary evaluation at Select Health of the Twin Cities. Dr. Antoine will review your conditions and symptoms to create a custom treatment plan to help you recover. Bone marrow aspirate concentrate (BAMC) is a concentrate that is harvested from your own bone marrow. Bone marrow is taken from within one of your large bones and mesenchymal stem cells (MSCs) and hematopoietic stem cells (HSCs) are collected in concentrate to be used to heal injuries. Similar to PRP, this process uses your body’s own healing powers, concentrated to a specific injured site. However, unlike PRP, BMAC contains growth factors and anti-inflammatory proteins that promote healing and reduce pain. BMAC can be used for more challenging cases and more advanced injuries or degenerative conditions. Bone marrow aspirate is collected through a needle placed into a large bone for the richest source of bone marrow, usually the pelvic crest. Once collected, the bone marrow will be separated into the various components and the stem cells, platelets, young red blood cells, and growth factors will be collected and injected into the target treatment area. Bone marrow aspirate concentrate is recommended for patients who have tried other treatment options with no positive results. Some of these therapies include physical therapy, prescription pain medication, R.I.C.E.E., and other injections. BMAC can treat all of the same conditions that PRP can, as well as severe osteoarthritis and deep tendon injuries. To find out if you are a candidate for BMAC or any other regenerative medicine therapy, schedule a complimentary consultation at Select Health of the Twin Cities today! Stem cells are the body’s raw, undifferentiated cells that are able to be manipulated into developing into specific cell types. Stem cells are used in a therapeutic manner to rebuild damaged tissue. Stem cells may be harvested from embryos or from adult bone marrow or fat. In orthopedic interventional medicine, adult stem cells are harvested from the adult tissue in the patient’s own bone marrow. Once a bone marrow or fat sample is collected, the stem cells can be isolated and manipulated or reprogrammed. The stem cells are then injected back into the damaged area to help rebuild healthy tissue. To help treat chronic pain caused by degenerative joint diseases, stem cells are injected directly into the injured part of the body. These stem cells then “recruit” other cells to help rebuild healthy tissue and reduce inflammation and pain in the area. Stem cell treatment offers an all-natural solution for pain. If you have chronic pain, stem cell therapy may be able to help you. Schedule your complimentary consultation at Select Health of the Twin Cities today. In addition, research and technology continue to expand and advance the field of regenerative medicine, with the hope that in the near future, we may also be able to use the practices to treat neuropathy. At Select Health of the Twin Cities, we partner with a local regenerative medicine physician to provide pain relief to patients who suffer from chronic pain related to spinal disc disorders and joint conditions. Depending on which regenerative medicine treatment you are undergoing, a small number of cells will be taken from you and spun down to separate the components. The concentrated cells will then be injected into the area being treated. These healthy cells, once injected, will trigger a healing response in the area they are. Initial swelling and soreness are to be expected as the body works to heal the area. These new cells will help repair damaged tissue and build new, healthy tissue. Over the next few weeks to months, you will notice a significant decrease in pain and inflammation and an improvement in strength. Each office visit is approximately 60 minutes. As with most medical procedures, results will vary based on your current condition and the extent of damaged cells. Depending on the severity of tissue damage, patients can find relief in as little as two weeks, and some patients experience results immediately. More extensive damage may require several injections before full relief is found. Your doctor will review all of your options and expected recovery timeline based on your condition and treatment plan. Am I a Candidate For Regenerative Medicine Therapy? 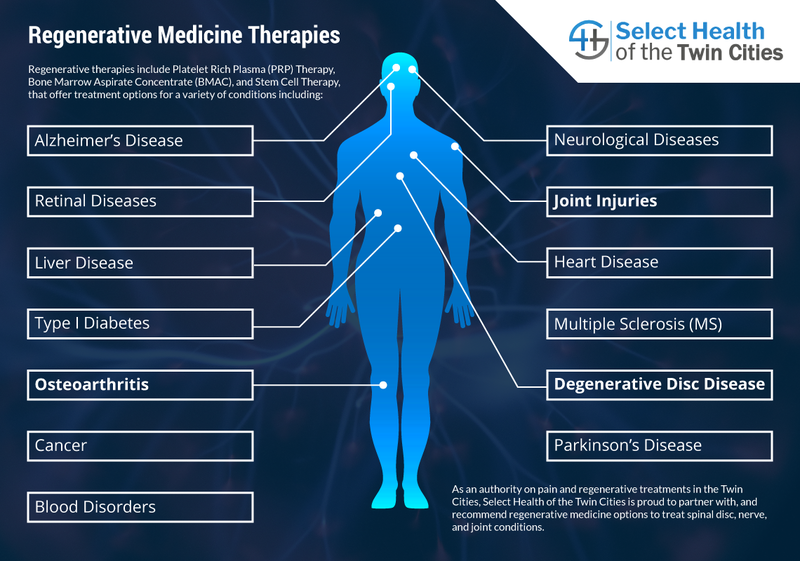 If you suffer from degenerative joint disease or injury, or you have suffered a musculoskeletal injury, you may be a good candidate for regenerative medicine therapies. When you schedule a complimentary consultation at Select Health of the Twin Cities, Dr. Antoine will conduct a full physical assessment and review of your medical history to determine which treatment option will work best for you. If you are not a candidate for regenerative medicine therapies, he can suggest the best treatment option for you.